What a timely offering! This guide outlines fifty ways in which you, your congregation, and your local community can help fight global warming and enjoy participation in a vital part of Christian discipleship. 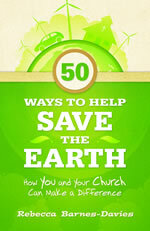 50 Ways to Help Save the Earth makes a clear connection, in a practical and unintimidating way, between stewardship of the earth and living one’s faith. This easy-to-follow book consists of seven chapters on topics related to global climate change: “Water,” “Energy,” “Transportation,” “Food and Agriculture,” “People,” “Other Species,” and “Wilderness and Land.” Each chapter begins with a statement on how the content relates to global warming, followed by seven action items ranging from individual efforts to activities that encourage the involvement of the congregational and wider communities. Each action item covers just two pages and may offer practical suggestions, relevant facts and background material, success stories, additional sources of information and, when appropriate, scriptural references to help bridge the gap between what we believe and how we live. For added encouragement, a “Walking the Talk” section is included, featuring examples of ways a person or faith community has made a difference. Beautifully illustrated, Rebecca Barnes-Davies’s book offers a lighthearted way to address global warming while teaching us to reshape our lives to honor rather than destroy God’s creation. Rebecca Barnes-Davies is an environmental activist with over a decade of experience in advocating for public policy changes, educating groups of concerned Christians, and writing numerous articles. She is a consultant for Environmental and Social Justice Ministries and also served as the director of Presbyterians for Restoring Creation. She is currently studying at Louisville Presbyterian Theological Seminary in Kentucky.